I am not a Stitching Saint. Not by a long shot! I try to be organized. I try to abide by all the good habits that, deep down in my Heart of Hearts, I know would make me a more efficient, and perhaps a better, stitcher. But, sometimes (ok, let’s be brutally honest here – more often than not! ), I fail. Case in point: thread organization while test stitching on this project. When I work on an embroidery project, especially one that’s clearly mapped out – like a kit, or something I’ve designed that doesn’t need a lot of troubleshooting – I prefer to organize my threads ahead of time, in a manner that will make them easy to access, easy to control, and easy to use. I don’t always organize my embroidery threads the same way every time I tackle a project. Depending on the project, my mood, the materials at hand, I might organize threads in a number of different ways. One method I use frequently is making my own thread cards – like these. All the threads are pre-cut and ready to use, which speeds things up. They’re all clearly visible by color number. You can separate a single strand of floss off the card without leaving the rest unattached to something, which also speeds things up (you don’t have to strip your floss) and keeps things neat. 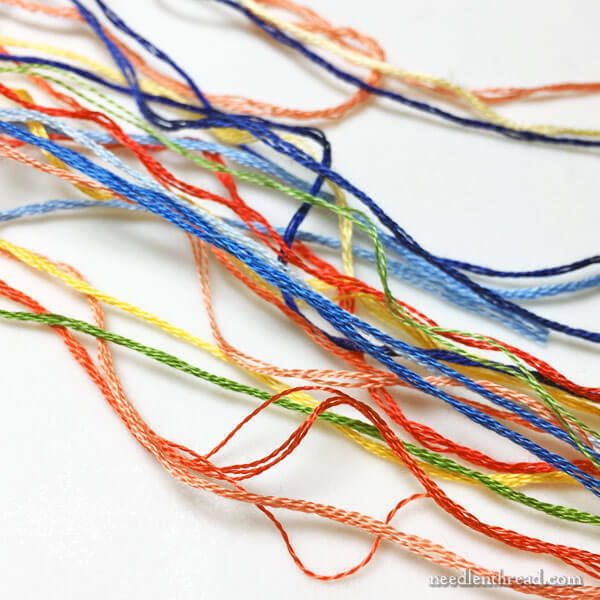 These are all excellent reasons to use thread cards, and, out of all the methods I’ve come across for organizing embroidery threads for a specific project, I resort to thread cards most frequently. The one disadvantage to thread cards happens to be one of its advantages: the threads are all pre-cut. It’s the advantage-disadvantage paradox! It takes time to set up your thread cards before you start stitching. If you’re all eagerness to start, this can be a drawback. You have to repackage and label leftovers when the project is finished. Sometimes, you might need a longer thread than the pre-cut length. Folks who have pets (cats especially!) may not want their threads dangling delectably before animals who might be tempted to play with them. 1. The Laziness Factor: taking the time and trouble to pre-cut all the threads and set up the thread cards, and, when the project’s finished, taking the time to package and label leftovers so they don’t go to waste. 2. The need of a longer thread than the pre-cut length. When embroidering with beads, for example, I like using longer threads, especially if I double the thread I’m using to attach the beads. To eliminate the extra bulk of the tail in the needle (so that thread and needle pass easily through the bead), the easiest way to double a thread for bead embroidery with floss is to pass one strand through the needle to the half-way point. If you’ve pre-cut your threads to about 18 inches, then your halved thread ends up being about 9 inches long, which necessitates ending and beginning threads more frequently. Still, all that said, I think the disadvantages to pre-cut lengths on thread cards are overshadowed by the fact that thread cards keep things neat! While test stitching Party in Provence, I’m working straight off the skein, with no pre-organized thread, for the two reasons mentioned above. I’m about halfway through the project. The growing mass of ensnarled threads in the first photo above represents all the bad things about not organizing thread in advance. Sure enough, there came a point the other day when I could no longer stand that billowing blob. And so I took the time to sort out usable strands of thread from the blob. I like this kind of work. I like separating threads, cleaning up a mess, things like that. Perhaps because it gives me time to ponder my next moves. Perhaps it’s because there’s always a little feeling of satisfaction when I get my act together and neaten things up. Whatever the case, I like to pull up to a table with a coagulation of threads like this – or any little things that need concentrated organizing – and organize them. Something in my brain likes the compartmentalization of the whole process. And yet, it is inefficient. But in the end, it was a pleasurable sort of inefficiency. When I’ve got strands of floss that are separated from a skein like these were, I bunch all the same colors together and whip them around the skein, leaving the color number tag visible. This allows me to use the pre-cut threads first…but, if I need a longer thread, I can still cut it from the skein. Either way, fault me if you must. I enjoyed cleaning up the mess. And I’ll probably enjoy making it again as I work my way through the second half of the design. What about you? 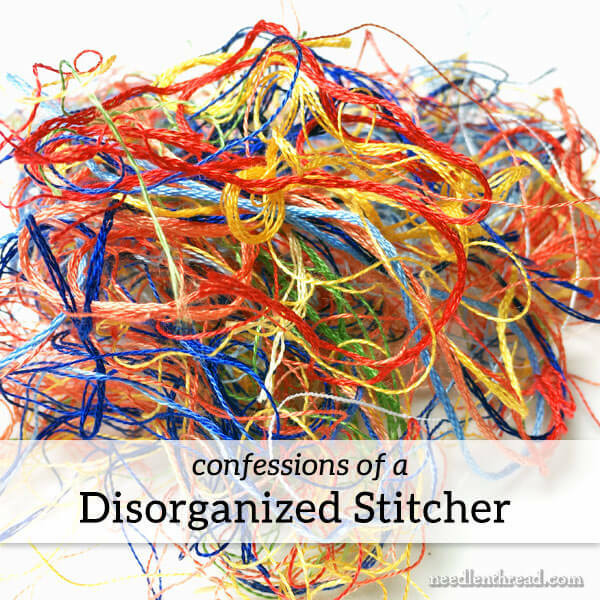 Are you an organized stitcher? Completely disorganized? Or do you fall somewhere in between? How do you keep your threads in order? Or what do you do with your resulting blob of usable threads or orts? Do you salvage the unused threads that might be in your pile? Or do you figure it’s not worth your time? I’d love to hear about your stitching habits with your threads! Feel free to join in the conversation below! Want More Tips on Thread Organizing? Ode to Orts – what do you do with thread scraps? Good morning Mary, I loved your article today. It was not only thought provoking but also fun, I love the Ode to Orts. My method of thread taming is the use of cardboard thread bobbins. They are all filed by number and kept in a large tackle box then I pull the colors needed for a project. I can’t tell you why I began to do this as it was decades ago and now it is a habit. Your thread cards look very interesting and you answered the question forming in my head—-what happens after the project. You said you bag the threads but how do you store the bags in an efficient manner? Thank you again for your wonderful newsletter. I put a white hand towel on a tray and line up threads on it ( in skein). Room for tools too. Also easy to move if needed. Also works in car ( smaller tray). Love to stitch while hubby drives. I have a friend whose mother lived through the depression years. After her mother died, the job of going through her things was a daunting one to say the least. So every day there were new discoveries….some treasures, some things to recycle and other surprises that would make her chuckle a bit. One particular day this little box was discovered. Since grandma was super=organized, the box was labeled. The label said, Strings too short to save….. I thought this would make you smile! I’m a crazy quilter, which means I use a number of different weight threads and I store them in plastic drawer units by color. I can’t stand a blob of threads like you had. So, as I use the threads I cut what I need and with floss I loop the remaining cut thread through the end of the skein. When the skein becomes smaller, I wrap it around a DMC winder. The partially used strand is wrapped last. Pre-cut threads drive me bonkers. They usually end up in small plastic bags. I wish there was a standard storage unit, but I think it’s the nature of the work that we have to deal with the creative chaos. I like cleaning up thread blobs too. If I come across some single threads I wind the pieces around a plastic bobbin. I pull them out when I’m practicing stitches. It uses them up and I feel very economical. In more recent times I have been doing more threadpainting where having your threads precut on a thread card is definitely an advantage as it eliminates stripping. However, the tidy freak in me just does not like to work with this card of dangling threads. To me it is as bad as dealing with your little pile of miscellaneous threads. And as you indicate, having these threads precut is a definite advantage when you want a longer length of thread. I store my cotton floss on cardboard bobbins and like the tidiness of that method. I do many types of embroidery. I use longer thread lengths for smocking than counted thread over one for example so precutting an entire skein limits it’s usefulness to me. I usually cut the length I need and withdraw the required number of strands. Then I fold the remainder in half and secure it to the skein- faster than wrapping and fewer kinks. I keep stranded cottons in snack size zipper bags in numerical order in large shoe boxes. I know this is not archival storage. But I have used the method for over 30 years with no deterioration. The little bags keep threads from tangling in my work bag and are easy to file when the project is complete. I only use non archival bags for cottons. I have too many projects on the go, so I have to be organized or it would all grind to halt forever. I always have the most enthusiasm at the beginning of the project, so I use that energy to get all set up with thread cards etc. right then. And for long projects I am always really glad that all the threads are labelled so I know what’s what when I come back to it months later. Pre-cutting threads can be wasteful, because I usually cut them long, but it is more wasteful not to finish the project at all. I am pretty sure that a thread snarl like yours would result in the whole thing going in the bin! I do okay with threads. I like the pause that prepping each thread requires. Orts are a different issue. A long session and it looks like a cat was in my threadbox. But my real struggle and frustration is beads. Some how or other the beads all jump together and become a Mosaic in the bead box. That generally means a bead out of place and lots of ripping. My best skill. I have probably spent more than I can count on ways to organize beads to no avail. Hi, Deborah! I use these to keep my beads organized: https://www.needlenthread.com/2015/07/organizing-beads-for-embroidery.html They work great! I’ve recently found more of them on clearance through JoAnn’s – if you have a JoAnn’s near you, check their website and store availability. Better if you can get them at a discount! I like having my threads organized. Some designers kit the ones you need on cards with several extra lengths for oopses. That makes getting started easy. When I have to sort the bundles that come in preassembled kits, I will sort through them placing them on cards or one of several thread palettes I have. When I have to choose my own from my stash, if they are on the DMC’s ‘keys’ or if I take a length from a skein, I will form a loop from the threads not used immediately, pass it around the skein or ‘key’, pass the ends through the loop and snug it up along the remaining skein. The cards will get labeled with the color number and if there is a ‘key’ shape I’ll draw that next to the number. I have a photo of what I’ve done with leftovers. I will send it to your email address. Hi! I have my entire thread collection organized by color and make. DMC is wrapped on plastic numbered bobbins and more precious threads are kept in an antique sewing box in their original packaging. Everything is sorted by color. When I start a project I use Glossybox boxes, which is a beauty supply monthly subscription. These boxes are 6×6 inches and are made of beautiful heavy cardboard. I tape a card holder on the end of the lid and name the project. I pull all the threads for the project from my thread “library” and put them in the box. As I work, I put my tools in the upended lid (pin cushion, scissors, ort box, etc). I only unwrap one color at a time and wind the leftover thread back onto the bobbin, card, or skein. When I’m finished for the day I put the lid back onto the box and place the box on my shelf. This system also helps keep out my curious cats! I’m lucky to have a spare room set aside for my stitching so I keep everything pretty organized and at the ready. My dad is a violin maker and his shop is meticulous. He taught me about keeping things organized so that you can work uninterrupted. A friend of mine is a professional organizer and she sets up people’s houses like a store. So basically in categories. So I set up my craft room like a shop. When I’m done with the project I immediately re-file the leftover floss and make a note to replace any floss I used. I love walking into my room and seeing all my hoops hanging from hooks, my threads in clear boxes, and my shelf full of projects waiting. Loved the article on organizing threads. I have my threads on bobbins and in numerical order. Stored in plastic boxes that are for that purpose. It works so far for me. My biggest problem is organizing for a project. I have yet to get it the way I want it. I am going to try your ideas and see if any fit, my ideas sure have not. Thanks again for the article. I would never stand for the thread blob! I use one of two methods to organize my threads for projects. The one I use for kits with pre-cut threads is the thread card. I have so many pretty wood and mother of pearl thread cards, but I seemingly always resort to cutting a small rectangle of cardboard, punching holes, then writing the color number and symbol, if any, before threading through the fibers. All my uncut floss is wound around floss bobbins. I don’t care about the little kinks that result because the thread is wrapped. The kinks smooth out in my stitching. So the second method I use, for uncut floss, is to put the bobbins in a ring. I usually have still wrapped full skeins of floss for most of the colors I have. These are sorted and go into small drawers until I have to refill a bobbin. I seldom put away threads from kits, especially when the threads have not been identified. If they are a stitchable length, 12″ or more is my deciding factor, they are wound and a small square of paper goes around them. The resulting “skeins” are tossed into a bag and donated to a thrift shop or children’s club. For kit threads that are identified, especially DMC floss, I have bobbins for the colors, so I wind the unused lengths (also 12″ or longer) onto the bobbin. For threads that come off my bobbins, unused lengths are also wound right back onto the bobbin. Shorter lengths of thread are tossed into my donation pile of old unusable clothes, fabric scraps and snips of thread. Goodwill Industries takes these as donations and they go to the rag man to be rewoven into useable cloth. For both ways, I avoid thread blob, though I also confess that I like sorting threads too! I just feel I don’t have the time and I’d rather be stitching. I don’t have any particular preference for storing my threads yet. I just keep all my skeins in a large freezer bag in a plastic box with all my general supplies. The biggest thing for me is making sure they all end up back in the closed box – your point about cats is especially important to me, since my cat had to have emergency surgery several years ago after eating a long piece of string. I always take any opportunity to remind people how dangerous it is for cats to eat string, since I didn’t realize myself until it happened! I have been so disorganised on my latest project a poppy for my sister and I have just finished with orts all over the place, as well as some threads on cards some on my table in no order and some bunched together near the cards, a lot of sorting out now as I tackle the thread colours in their proper compartments, yuk, not my favourite pass time, but it does give me time to think about my next project. Two of nieces are pregnant so its time for a couple of quiet books or cloth books for babies, lots of ideas are going through my head so I can tidy my messy thread stash while I contemplate colours and ideas for baby pages. Thanks for sharing your disorganised threads with us I can totally emphasise with you. Have a great Monday Spring bank holidat. I smiled when I read that you liked organizing your threads. When I am stressed, I will sort my threads for a project or sort beads that have gotten spilled together (whether on purpose or accidentally). I find that when stressed my stitching will usually need to be picked out because the tension will be uneven or too tight. By the time my mess is sorted, I am calm and ready to embroider or weave. Orts: I have a friend who spins and I give her all my orts. In fact most of us in our Mariposa Fiber Arts group give her our orts. She spins them into the most wonderful multifiber yarns that she then weaves or knits. Before I met her, I used orts for stuffing pillows and I hung them in the trees (in little bags made from the mesh wrappers citrus comes in) so birds could use them for their nests. I stitch every day with a friend and sometimes my mom, and that’s exactly what we do! The wrapped skeins can go back in the drawers with the rest, and they make it easy to see which skeins have been used if only a little has been taken out. I also keep a magnetic strip by my desk loaded with needles in my most-used colors, so if there’s a bit of extra red or black or whatever, it can go right there ready for next time. My husband sells and buys on eBay and I’m up to my eyeballs in cardboard. I cut rectangles of cardboard so it fits in my project box, cut slits in the cardboard, write the color in fine sharpie and put the wool into the slit. Easy peasy. I had a box of threads given to me last week-stuff from the 1940s wrapped on bits of cardboard and just clumped together. You know the kind of thing – we’ve all inherited some boxes. This time I had been winding knitting wool into center pull “cakes” the day before and I decided to make cakes with the stranded cotton – used a Bic pen to wind around. Each skein went from a messy wad to a cute little ball. There were a lot of one yard or less bits and those got laid out neatly, “into the needle”ends together,cut in half (and put together correctly),loosely looped at the top, and put into the crazy quilt box. I do not suggest that making cakes with your threads is a good thing for everyday use but when a bit of tidying up is what your brain needs it is quite a relaxing way to go. A bout of this sort of sorting is as good as a nap! My DMC threads I buy ready sorted on large bobbins from Leisurecraft in Tewkesbury and then I cut off one or two threads, depending what I nee, at the length I want which means that the rest of the skein is still neatly on the bobbin – and of curse I can cut a longer or shorter thread if necessary. This was a fun article as I too enjoy organized and messy. Although I am usually only messy when I do crazy quilting or silk ribbon embroidery. When I use floss I am very organized. I use business envelopes that have the color number on the upper right hand corner. I keep them in a file cabinet for envelopes. I pull out the numbers needed for the project. This way I can put the cut pieces back when finished. Thread blob?! I had no idea such a thing existed. I never precut threads as that might cause unnecessary leftovers. I keep the skeins laid out next to me and cut from them as I need them. My “stitching chair” has nice flat, wide arms in a slightly plush fabric so nothing falls down and no side table is required 🙂 I use it as a pincushion too! If a project required many skeins, they would be in the project bag (clear zipseal bag) and I’d have out just what I’m working with during that session. Strands waiting to be used are laid with their skein, and when I’m done any unused strands get wrapped around their skein as you have done. I don’t use bobbins, hate the kinks. Actually, I do have a collection of random threads that would look like a squashed thread blob if I took them out of their bag – leftovers from kits, ends of skeins etc. Great for practising stitches, tiny projects, samplers, or those times when you just need a wee bit of a colour! I just went to the dollar store and purchased a box (or more) of the 3 5/8 by 6 1/2 inch envelopes. I put each color in an envelope and write the number on the outside. When I have a strand left, I put it in the envelope with the full skein, or thread card, or thread bobbin, along with any other left over pieces. Before beginning a project, I organize them numerically in an old shoe box or plastic container of some sort, depending on the size I need to accommodate my project. The only drawback is that I cannot see the threads without pulling them out of the envelope. However, I have used this method for decades. It is affordable, and I never have blobs that need sorting. If the envelopes get old, I spend another dollar for another box of them. Leaves me more time for stitching! Yes! I laughed when I saw this offering this morning over the coffee, I needed it as I dont feel very well this morning. You said that you enjoy detangling and cleaning up, I had never thought of that but so do I. The joy of unravelling a Gorgon”s Knot is soothing I find….or it can be otherwise depending. I prefer uncut threads off the skein as I find the precut things on cards always tangle, and yes what to do with any left over useable thread ( you cannot throw away good thread IMHO). I have tackle boxes with skeins wound onto thread bobbins which are numbered and so into the box of DMC, Anchor, Semco etc. Unlabelled skeins(usually from gifts from someone’s cupboard) are categorised by colour and hue. My OCD can’t tolerate disorder, so my thread is in Floss-A-Way bags. A less expensive alternative would be generic 3″ x 5″ plastic zip bags (local craft store or eBay). I save my orts and in early spring, I place them in a wire basket that I hang outdoors. My neighborhood birds help themselves to this exotic nesting material! I am not at all organised in many ways – I live in a *whispers* bit of a mess! However, I do enjoy untangling skeins of embroidery thread and wrapping them onto little plastic bobbins. Perhaps it’s because I can control one area of the mess and I also love to see the colours arranged neatly in the storage box as it makes me smile. How about a compromise between precut threads and using the cards? Set up the thread cards with the number/colors you will use listed, but do not precut the thread. Instead of precutting all the thread, start using the thread from the skein, etc. cut the thread as needed. If you are not using all the plies, immediately after separating the ones you need put the others on (through?) the thread card. Now you have what you need to stitch and the others are set apart and organized waiting to be needed. When you finish stitching with the thread you are using – changing to another color, taking a break, done for the day, etc. Put the leftover thread on the thread card also. This way there is no cut thread lying about, but you do not have to spend time precutting thread and can adjust the length of thread to be cut as you go. What a great idea. I like using a thread card but not precutting. Lately I’ve been doing blackwork or redwork so only one color but am gearing up for a big project with a lot of different colors and I think that’s how I’ll work it. Your end of project skeins look exactly like many of mine with those oddments wrapped around the label! I never use bobbins, never arrange in thread cards (only ever used them if a kit came like that) and just keep each project’s threads in a disposable plastic sandwich bag. I’m trying to upgrade to a small Really Useful Box, but I’m not sure how that will work. I do as you do Mary and make my own thread cards for projects and place in little bags. I find this works well. I don’t put whole skeins onto the cards, perhaps 6 or more 16-18 inch length pieces. When and if I use these I cut more from the skein. I keep skeins for each project in bags sorted into colour shades so they are easy to find. This way I don’t end up with lots of leftover cut threads. When I have finished the piece I store the cards with other unused thread cards so I have a supply of threads for samplers or other stitching experiments. I am devoted to thread cards. I put the color symbol beside the thread #. I saved the back of Rx pads for years so I have a SABLE stash of cards to use (in a tidy box in my closet.) After I finish a project I cut the cards apart, leaving # with color. Then I put the thread into the proper “snack ” bag on a large ring. Actually it took me 3 large rings for all DMC colors. Next project I go to the snack bags first, before I open a new skein. Many years ago I was lucky to buy 3 DMC narrow wooden boxes from a LNS owner who was changing to the square size DMC thread boxes. I love the way they look on my book shelves 🙂 PS: I tend to wind thread around an average size magazine and then cut into strands. Works for me. I have ‘orts’ containers all around the house. In the lounge room, it is a small compartment set aside in the box I use for the project’s flosses and on the kitchen table it is a paper fold down box (I got the pattern from Carol Pedersen’s book “Hardanger Tips, Tricks and Fix-its” and made a stack of them from large gift bags from the cheap shop). I’ve handed them out to stitching pals and I have one of these in each project. In my ‘sewing sweat shop’ I have a large Ikea zip lock bag to collect orts in and then this full bag is given to a friend for stuffing into knitted animals. Pretty much, there is a use for everything! I am a disorganized stitcher. I hate using thread cards although I an using them for my very large Heaven and Earth Design-Reptiles by Escher. I also use those thread holders shaped like butterflies for the more complicated Mill Hill bead kits. But if I am pulling threads for a canvas piece-watch out ! When using DMC and like threads, I pull out all 6 strands until I have 4 skein lengths exposed. Then I carefully snip one strand at a time RIGHT AT THE BEND NEAREST THE SKEIN and pull straight up to free that strand from it’s mates. If I’ll only be stitching a tiny area, I adjust the strand length accordingly. This way, I never have ‘orphan’ strands of floss (ie: strands separated from their original skein). Once I’ve finished a project, I remove the number tag from each skein, fold up any unused strands, and replace the number tag all ready to be returned to my thread drawers. This was a fun read and informative. I had no idea there was a how to organize threads method and I may give it a try sometime. I lay my threads out whole on a tray that also holds any tools, pattern etc. I make a pile of cut thread ends and a pile of longer threads. The too short ends go in a bag, an idea will come along for them. The longer pieces get separated and go into another bag, all of these eventually get used in a free for all type project. I’ll have to try the card method next time but I have a feeling I will stick with the tray as I’m usually antsy to get started. I also like sorting out a tangle. It gives the same kind of satisfaction as weeding a messy perennial bed or hanging out my sheets evenly on the line. I’m sure my more impatient neighbors laugh at me sometimes but for me it’s relaxing to do nitpicky things. Last year, I ordered a lot of DMC colors for a project and decided to organize my floss collection before it got too large. I wanted to sort them by number and file them but also be able to see the colors and keep short pieces with the skeins. So what I did was buy a few boxes of plastic zip lock bags and larger index cards. I put the color name and number and any other comments (like if there is a sewing thread that matches that color or a certain project I want to remember that I used it for) and put the card in the bag along with all the skeins and pieces of that color. Then, because the card makes it stiff, I can file them. Originally filed in a couple of shoeboxes but then my daughter passed a couple of bins that size on to me which worked even better as they were a bit deeper. I did have to cut the index cards a little smaller but still only took an evening or two to set up. Hi Mary, I so look forward to hearing from you every day! I guess you could say that I’m super-organized (at least in my stitching!). I put my skeins in little ziplock bags made for that purpose. The bags are labeled and put in divided tool cases. When I start a project, I pull the threads I will need, and put the bags on a ring. I keep that ring of skeins with the project. I tend to work with one color at a time, and when done with that color, I wind the leftover threads onto the skein, put the skein back in the bag, and go on to the next. I have cats, and have to be super-careful about leaving anything out where they can get to it. Good Morning Mary, I love to see your news letter in my email, they brighten my mornings. In New Jersey we need some brightening, it seems the sun has not been out in weeks. I bought myself the full set of DMC floss. My husband made me a set of divider for my drawers, that perfectly hold the floss away bags. I keep all my threads, in bags, in the drawer. When I start a new project I put the bags on a ring and when I am done, I put them back in the drawers. This way I can keep all the short pieces of thread in the bag ready to use for that one stitch you for got to stitch. I love to sort and organize also, my sister says it runs in the family. When I see a lump of thread I can’t help it I have to organize it the bigger the better, such a sense of accomplishment when I am done. This is the method I use to organize my DMC threads also, using floss away bags. Maybe it’s a Jersey girl thing :-). They are all in a flat clear storage box in number order, so I can easily find what I need for a project. These then go on a ring again in number order. Leftover cut threads go back in the bag while stitching. I wind unused thread around 3 fingers and thread that ice already stitched with around 2 fingers. This prevents them from tangling and I can tell used from unused by circle size. I find the bags the easiest and fastest way to store thread. All that winding would drive me nuts and I prefer not to precut thread for most techniques. The rest of my thread collection is store by brand and type in clear shoe boxes. After my grandmother died, my grandad gave me her embroidery things, including a HUGE thread blob. My mom told me Grandma never sorted or organized her threads. She just pulled a color out of the blob, used it up, and pulled out another color that was close to the first. We can see this in her embroidery: sometimes there is a color shift midway through. When she was finished, any leftover threads went into the blob, awaiting the next project. Seeing the photos of your blob made me smile, remembering my grandma. Mary, realize your talking about thread but noticed in one spot you talked about two strands for attaching beads. I have a question are you using bead thread or floss to attach beads?? Another question are you using glass beads?? Have you considered that the glass beads can and will cut floss happened to me many years ago and started using beading thread. Just a thought. Hi, Nancy – Bugle beads are really the only beads I’ve run into that have a problem with sharp edges. Especially the higher quality, more consistent Japanese seed beads and delicas like those distributed by Miyuki, TOHO and Mill Hill, are nicely finished and smooth. I’ve never had a problem with them wearing down floss. When I’m doing surface embroidery that’s primarily embroidery and the beads are just an accent on the stitching, I use floss to attach the beads. I’m just not fond enough of nylon bead thread and the like to bother with it for this type of work, although, when the circumstances require a stronger thread, or when I need a little more confidence in the thread than cotton floss would give me, I might opt for a twisted silk in a matching color. I use a mixed method to organize my threads on projects. Skeins are kept in approximate numerical order and rolled in a white piece of cloth. I put any leftover usable pieces on the cardboard thread holders (the ones with holes punched down the sides), identifying the colors by either symbol or number. Keeps me nicely organized and makes finding the appropriate thread easy. I love your blog even though I haven’t done surface embroidery for years. I do counted cross stitch. I keep my floss on bobbins and wind the stripped off threads back on the bobbins. Deep breath, here comes my confession. I throw away floss. If I thread my needle and take two stitches of some color (happens often with confetti heavy designs) I throw it out. I keep my orts in a jar by my side and empty it when it gets full. Thread blob – love it! Makes me remember back in high school (eons ago!) where a girl a couple years ahead of me did a lot of embroidery – on what, I’ve no idea now, but she used basic floss, DMC or JPCoats or some such, and as she always worked freehand, she’d cut a length, thread up as many plies as she wanted and put the remainder – and any usable-length leftovers and the uncut portions of the thread skeins – in a bag. A good sized bag. That was a serious thread blob, but she *used* it! So a couple years later when I was embroidering designs on my jeans (see, told you it was eons ago), I did the same thing, but with a much smaller bag. Rarely did any part of my thread blob tangle. These days I almost exclusively do counted thread embroidery, and I use plastic bobbins for my DMC and the little baggies for my overdyed threads and silks. After stripping the needed plies, I wind the remainder onto the bobbin. For larger projects like my current sampler, those bobbins go in one of those smaller plastic boxes, the kind that’s divided into six or eight sections. Mostly I’m neat about my threads, but right now there’s a golf ball sized thread blob in one of those sections. *** Thank you for your blog and for the wonderful resource of your stitch videos – never would have been able to manage trellis stitch without your help! I guess I’m sort of organized. Just wondering why you don’t use cards, thread cards. I find that I can use rings with different projects on them. The baggies and ring system are usually my solution. A lot of the projects I work on have multiple types/brands of fiber, which may come in skeins, on cards or on spools. Since I store my DMC floss in the bags, when I’m done with a project, I can just put those back in the correct containers. I use thread cards and/or bobbins. If it’s a “small” project I just leave thread on the bobbin and cut off lengths as needed. If it’s a large project (or a kit that comes with thread cards) I use the thread cards and only put 1-2 lengths of floss on the card, leaving the rest in the skein/hank/bobbin. That way I don’t “waste” thread by pre-cutting it. I use a music stand with arms that go up to hold books/sheet music, so when I’m using a lot of 1 color, I put the bobbin or skein on the ‘shelf’ in front of the pattern, and hang the working length/s off the arms. Right now my music stand has a Joan Elliot design on it, and I’ve got 8 bobbins and 2 krenik spools on the shelf. I’ve got 6 of the bobbin colors lengths hanging off the arm and about a 4″ length of a krenik. (I trained my cats that touching stitching stuff is naughty.) I do it this way since I don’t want to mess with similar colors getting mixed up (especially if only using bobbins). So if I have 2 similar light blue colors, I’ll hang one on the left arm, and the other on the right. Leftover useable lengths of thread go back on their bobbins to be stored in their plastic tubs in numerical order. Leftover kit thread generally goes in the trash (if it’s not DMC I’m not messing with storing it). DMC kit thread I *may* store, but generally not. Wish I could send you a picture. I also use cards, but I use cardstock as it folds easy. I put the holes on one side because I fold the threads into the card and fold the card in thirds to hold them. I use a paper clip to close and keep all the project pieces together in a project bag. I tried using rings but the threads tangle. This is the best way I found. I just need to remember to put all threads back in the main plastic holders where I keep all Brazilian threads. I use just baggies for other threads as I mainly use the Brazilian threads now. 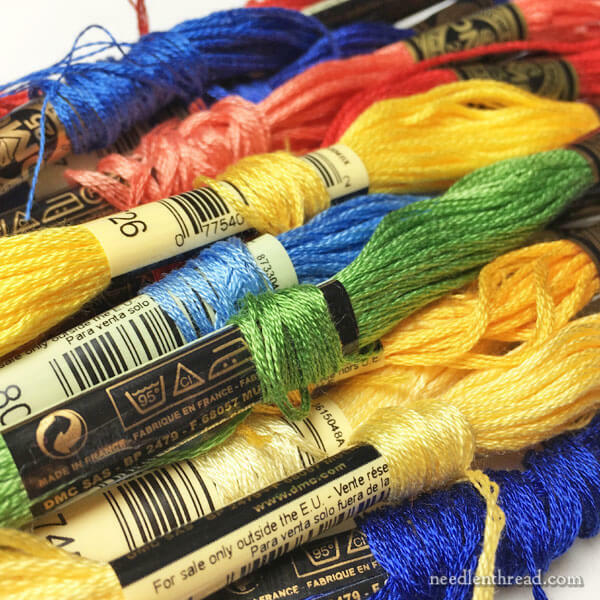 Previous Previous post: Silk Embroidery Threads – a Delectable Give-Away!